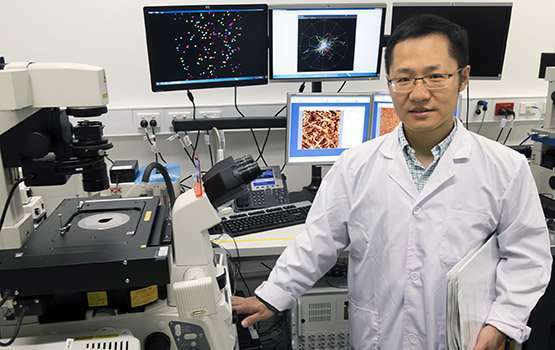 Associate Professor Qiaoliang Bao from Monash University's Department of Materials Science and Engineering, along with research colleagues at universities in China, found that antimonene, a 2-D material, has improved sensitivity than graphene in the detection of DNA and MicroRNA molecules related to cancer. The study, published today in the international science journal Nature Communications, provides a significant advancement in the detection of biomarkers MicroRNA-21 and MicroRNA-155, which are found in many tumours that lead to pancreatic cancer, lung cancer, prostate cancer, colorectal cancer, triple-negative breast cancer and osteosarcoma. "The detection of tumour-specific circulating MicroRNA at an ultrahigh sensitivity is of utmost significance for the early diagnosis and monitoring of cancer," Associate Professor Bao said. "Unfortunately, MicroRNA detection remains challenging because they are present at low levels and comprise less than 0.01% of the total RNA mass in a given sample. Therefore, new approaches are urgently needed for clinical disease diagnosis." "Antimonene has quickly attracted the attention of the scientific community because its physicochemical properties are superior to those of typical 2-D materials like graphene and black phosphorous," Associate Professor Bao said. "The combination of antimonene with SPR architecture provides a low-cost and non-destructive improvement in the detection of MicroRNA, which could ultimately help millions of people globally by improving early diagnosis of cancer."